Within a compact space, choosing the right pieces of furniture is crucial in order to feel relaxed and comfortable. Maximize every square foot of your room with Bestar's Small Space units! Durable commercial grade top surface with melamine finish that resists scratches, stains and burns. 3 open compartments to keep you organized. 1 closed compartment with 1 adjustable shelf and 2 grommets for efficient wire management. Assembly Required. The Liberty 53.14 Mid-Century Modern TV Stand is the perfect blend of quality craftsmanship, brilliant design, and purposeful functionality. Featuring a large open compartment, one hidden cubby, and three center shelves to create the ultimate entertainment center perfect for stashing dvds, board games, electronics, and media accessories. Free standing and easy to maneuver, this piece will mix well with any decor and its artful grooves will create a statement in any space. Available in white, white and rustic brown, white and aqua blue, white and yellow, rustic brown, rustic brown and white, and rustic brown and yellow. Traditional with touches of modern design, the Sullivan TV stand offers storage space, functionality, and the ultimate entertainment center to capture your favorite audience with a movie night in that's every bit as great as the theater experience. Featuring long open shelving perfect for stowing a DVD player or Blu-ray system, and two cabinets for books, magazines, remotes, and other entertaining essentials, this piece is casual sophisticated at its best. Great in a beach house, colonial, or modern setting, its a tv stand that will blend well with any decor. Small Space 53.5-inch TV Stand - Bark Gray & White Within a compact space, choosing the right pieces of furniture is crucial in order to feel relaxed and comfortable. Maximize every square foot of your room with Bestar's Small Space units! Durable commercial grade top surface with melamine finish that resists scratches, stains and burns. 3 open compartments to keep you organized. 1 closed compartment with 1 adjustable shelf and 2 grommets for efficient wire management. Assembly Required. 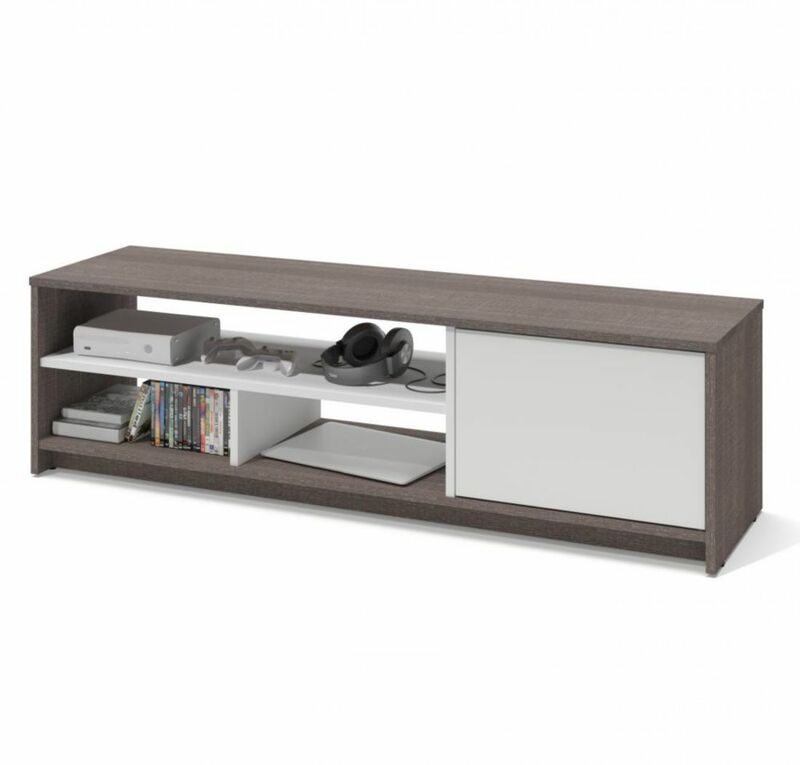 Small Space 53.5-inch TV Stand - Bark Gray & White is rated 2.0 out of 5 by 1. Rated 2 out of 5 by rebecca from Looks good, but poor quality One of the particle boards were damaged. I returned it and ordered another one. The new set had other damaged particle boards. Instead of returning it again, I contacted the manufacturer and they sent me new boards free of charge. That was very helpful because the boards are really heavy!